The Studebaker US6 2½ ton 6x6 truck was part of a family of trucks produced in the US during World War II. It is best known for the vital role it played in the Red Army’s victory over the German Wehrmacht. The US6 was intended primarily for export to America’s Allies under the Lend-Lease Act. The 6x6 version was intended to operate off-road, and was produced in both short (148 inch) wheelbase and long (162 inch) wheelbase versions. The 6x6 version was rated to carry up to 2½ tons, while the 6x4 version could carry up to 5 tons but was limited to roads. Most were built with an enclosed metal cabin. A total of 219,882 2½ ton 6x6 and 5 ton 6x4 trucks in thirteen variations were built. Studebaker Corporation was the primary manufacturer, building 197,678, while REO Motor Car Limited was sub-contracted to build 22,204 more. REO trucks are identical to Studebaker’s, but REO only built the long wheelbase model without a winch. 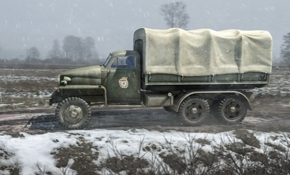 Of the total produced, 152,000 (including all of the 6x6 production) were sent to the USSR, where the Studebaker’s reliability and durability made it very popular. It was known as “Studer” to the Soviet troops, and was used for transporting troops and supplies and (due to its off-road capability) as a gun tractor. The Studebaker was instrumental in providing the mobility that the Red Army needed for its successful offensives against the Wehrmacht. This highly detailed plastic kit depicts the long wheelbase version of the Studebaker US6 2½ ton 6x6 truck, either without a winch (model U3) or with a winch (model U4). The kit includes the metal cab (moulded as a single piece) and an optional canvas canopy, as well as a choice of an open or closed rear tarpaulin cover and tailgate.